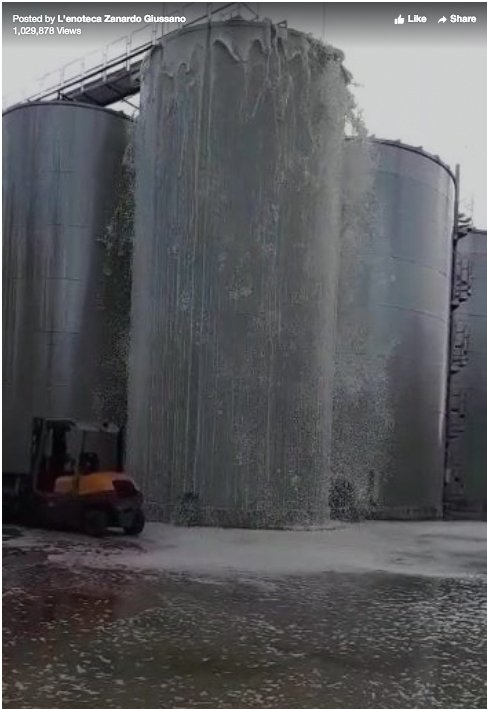 Anyone who likes prosecco knows it’s shameful to waste even a single drop, so I’m sure a winery wasn’t too impressed when they lost 30,000 litres of the fizzy beverage when a fermentation tank exploded. 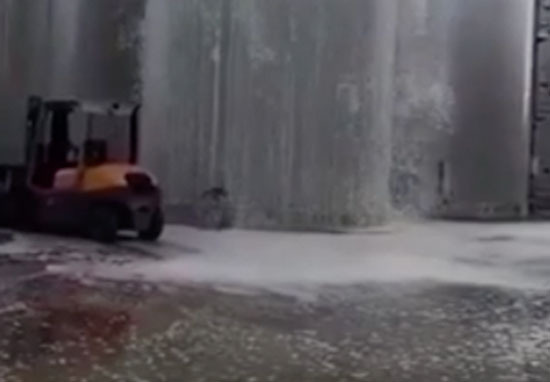 The unfortunate incident took place at a winery in Conegliano, Veneto in Italy, where a devastated employee caught the chaotic scenes on camera. 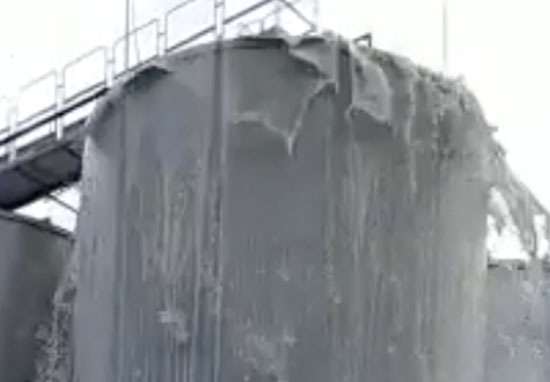 It’s unclear whether the tank was overfilled by the staff or whether the lid of the tank developed a fault, but either way, disaster ensued. I mean, we’re all used to a few bubbles and a bit of fizz with prosecco, but this was something else. 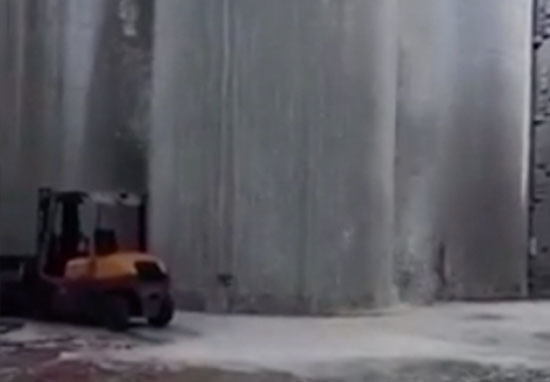 The liquid flooded from the huge tank and created a prosecco river – which in normal circumstances would sound like a dream come true, but in this case was just a devastating waste. The tragic footage was shared on Facebook by the L’enoteca Zanardo Giussano winery last week, where it has since racked up over a million views as people watched the explosion of bubbles. Fortunately for the wine-producing region, wineries in Veneto have experienced one of the best harvests on record, meaning hopefully they’ll still have some fizz that makes it into bottles. Almost 600 million bottles are expected to be produced this year – though it might be a few less, after this explosion. But still, even if only 599, 000 million bottles get made, I’m sure we’ll manage. But at the end of the day, it’s still 30, 000 litres of prosecco down the drain. Excuse me while I wipe away my tears at the loss. According to Coldiretti, the country’s biggest farming association, Britain has seen exports of prosecco fall for the first time in a decade. Exports of the Italian sparkling wine dropped by seven per cent in the first half of this year as drinkers increasingly opt for English fizz instead. The tensions caused by the Brexit negotiations and an increase in duties, but also nationalistic fake news aimed at discrediting Italian sparkling wine, have had an effect on exports. People commented on the unfortunate scene, with many understandably reacting with the crying face emoji. I think this video will teach us not to leave behind any of the bubbly beverage after the amount that’s already gone to waste! Top tip – put a teaspoon in the bottle after it’s open so it keeps its fizz. I’m almost positive it works.